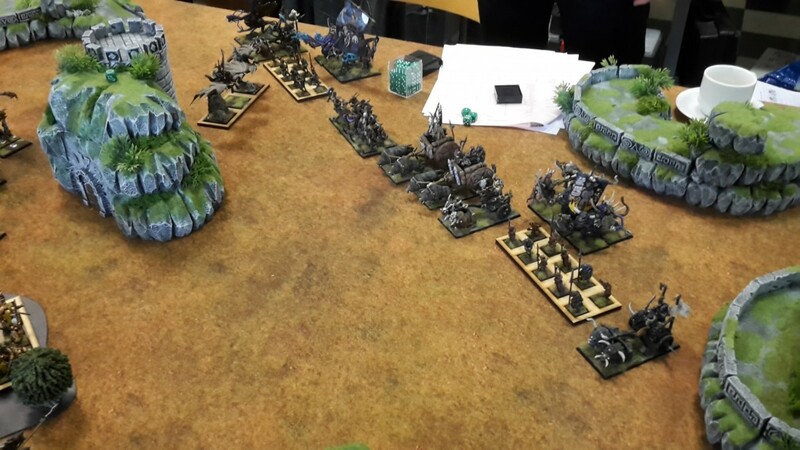 The 16th Conflict Tournament – A short battle report. There have been several instances during my time in the hobby that the call of gaming was too strong to ignore, despite my conscience saying otherwise. This was the case a couple of months back, when I was persuaded to attend Connectr’ team’s annual tournament in Gelrode, Belgium. These guys have been one of the most active T9A communities in Belgium, and they are known for organizing tighly run, enjoyable tournaments. 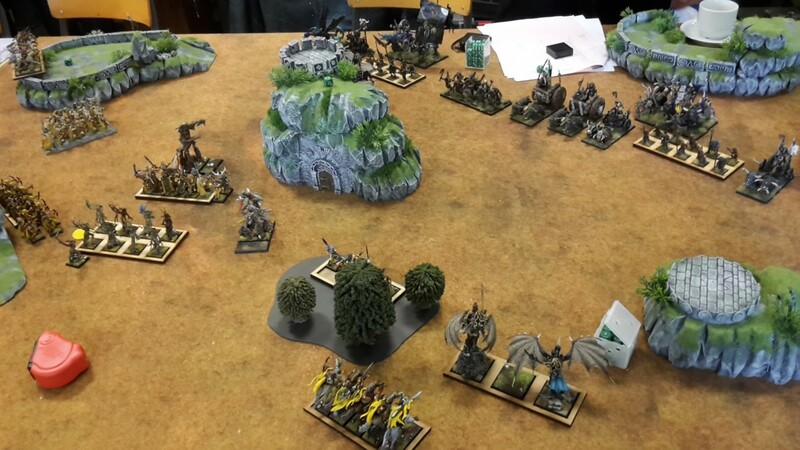 It was no surprise that their event this year was the biggest yet T9A event in Belgium, with more than 60 players signed in. In the end, around 40 made the trip all the way to Gelrode (30 minutes drive from Brussels, which is practically half across Belgium). For this tournament I didn’t quite have the time to paint or prepare, so I went with what my gut told me to; I took the list I played at the Lille tournament, then modified it according to my post-tourney observations. So I had to lose the Pathfinders so as to get points for the Briar Maiden wizard conclave, then I boosted some more the Bladedancers to make them into a retinue for the BSB. Since I had a big problem with scoring in Lille, I dug out the scoring Heath Riders. Finally, the Wild Huntsmen sat at the bench for once, leaving their place to a second unit of kestrels. 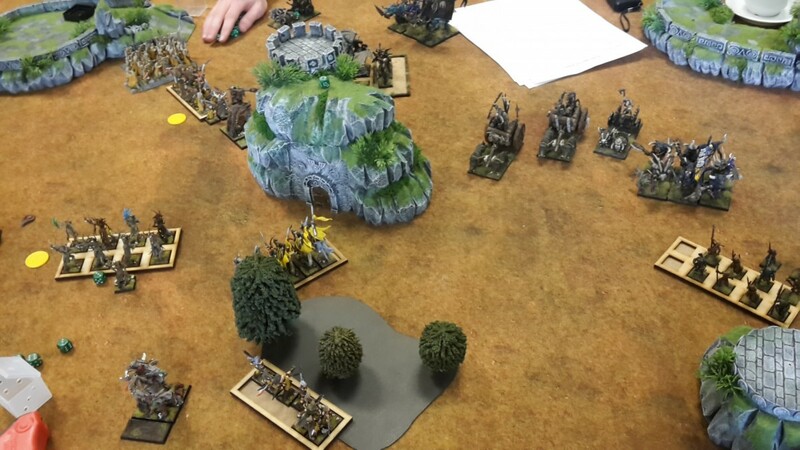 So all in all a list with lots of chariots ignoring DT for forests, an unkillable chariot lord and ambushers throwing a ton of axes on turn 1. The saving grace for my army was that the opposition was extremely magic-lite. We got Hold the Ground and Refused Flank Deployment, and after a couple of exchanged drops my opponent dropped everything to force me to play first. The terrain heavily dictated the way I played, since the middle was occupied by a big piece of impassable terrain. A mixed blessing, since it would create bottlenecks forcing me to fight the beasts in a straight fight. In the end, I opted for rather aggressive vanguards for both Kestrels, while the Treefathers stayed close to the centre, able to move up on either side of the impassable piece depending on what the Chariot Lord did. Knowing I’d get the first turn, I had the opportunity to move up the Kestrels right in front of the mongrel raider screen, in a position where his Minotaurs with BSB got blocked. In the following turn the mongrels and wildhorns charged in, and thus began a long fight between them that would eventually end in a win for my birdies. Covered by the birds’ antics, my big dancers, treefather and Forest Guard moved up aggressively, ready to engage the BSB’s minotaurs. The archers killed a Raider Chariot, while the Briar Maidens put a couple of wounds on the Jabberwock. When the Ambushers arrived, a well placed volley by the archers caused a chain panic reaction that sent two of them fleeing off the board. The third got taken care of by the rightmost Treefather. The right flank advanced very cautiously, with the small bladedancers tempting the Chariot Lord to charge them inside a forest. He did, and they stuck in combat for a couple of rounds. I then failed my steadfast and fled off the table. The rightmost treefather was awaiting the Beastlord inside the forest when he came back from pursuit, and he took the charge:after a failed Fear test (the BSB was too far away) the tree managed to not only survive, but also put 4 wounds on the lord with a Crush attack! This proved to be too much for the lord who fled off the table. Over at the left flank, the combination of swiftstride and movement 6 allowed me to get the jump on the minotaurs with my big dancers: after my attacks, 5 minotaurs lay dead and the BSB subsequently broke. He escaped pursuit, but would get charged again on the following turn and would flee off the table. The Jabberwock failed a charge against my dryads and got countercharged and killed by my Forest Guard, while the Impaler Centaur chieftain failed to wound the Treefather from afar and instead went for the general’s dryad retinue. 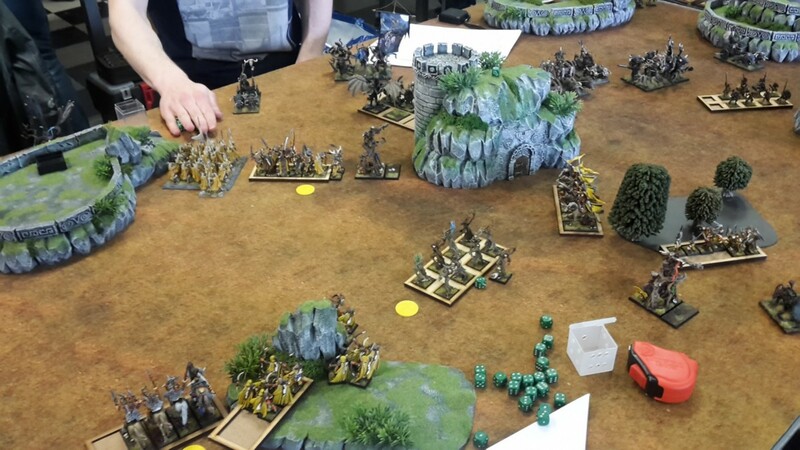 They held on a low roll, and then the Sylvan Archers charged in the flank to help out. The chieftain was eventually killed by a countercharging treefather. All the while, the Kestrel units combo charged the Razortusk chariot and ground it down. The remaining raider chariots were forced to flee a couple of times (kestrel charges) while the 6-strong Minotaurs never saw combat due to their placement. In the end, I managed to claim the objective and kill a good deal of my enemy’s army for no losses back whatsoever, ending the game in a 20-0 win. 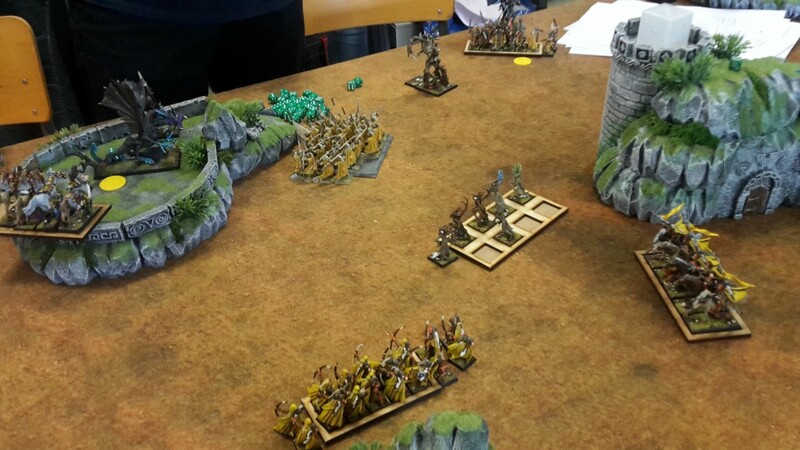 This game was lost in deployment for my opponent, since deciding to split his army and distance his Beastlord general from the main bulk of his forces left him too vulnerable to my shock troops. While I had to sacrifice the small Bladedancers to pull the chariot lord out of position, I consider It a good compromise: it let the bladedancers and the forest guard roam free. The treefather crush attack was unexpected, but I’ve found that in the cases where the enemy save is too high, one might as well go for broke and tempt the dice gods. Sometimes it works wonderfully!